Whew – just in time! I didn’t think I was going to get these done this month, but look – just at the end of September! 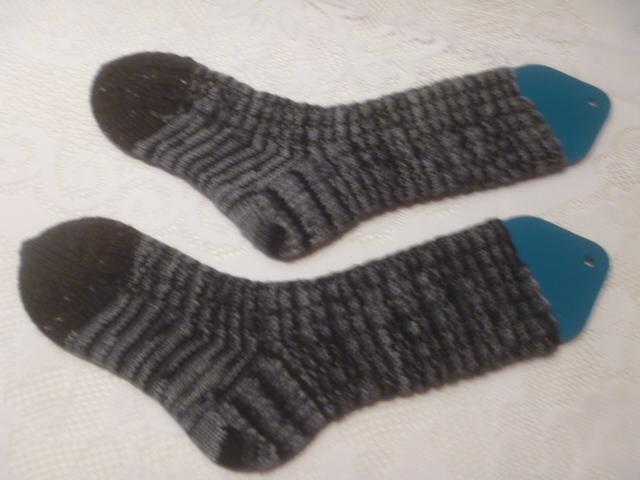 They are finished and are a nice dense, warm, wool, winter pair of socks. Yarn into socks. 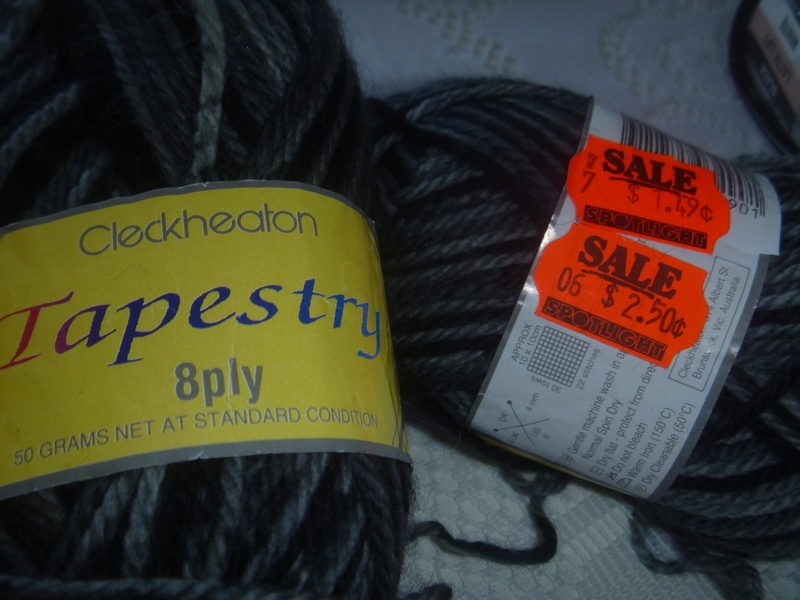 This is the pair I paid US 75 cents/skein which equals 1.50 for this pair. I love these bargains. I have to keep plugging away to get these done by the end of the year. 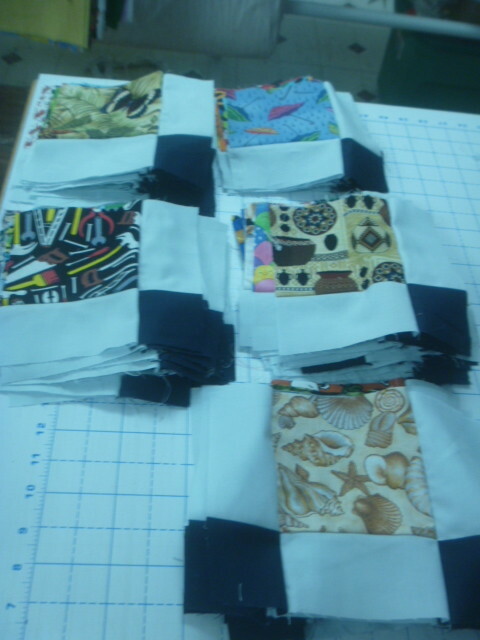 Here are some rows put together. 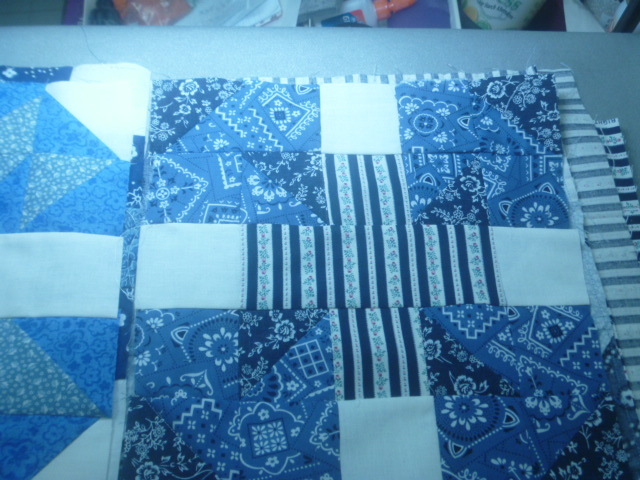 It looks blue because the white is actually a very pale blue. Putting the blocks into rows is pretty straight forward. 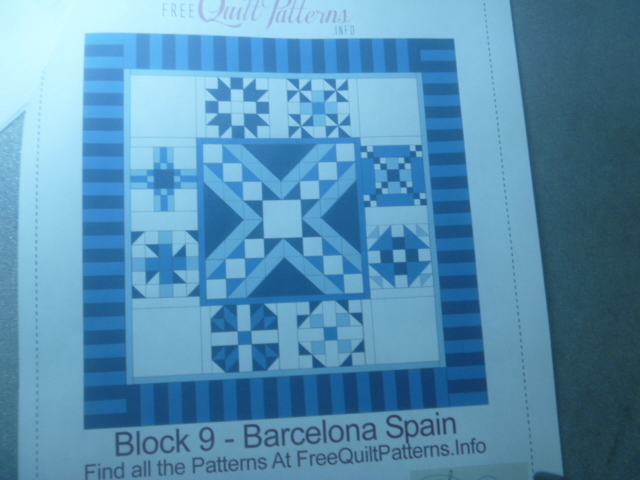 Accuracy at every step is really important, because after the blocks are put into rows, those rows will have to match each other to make the quilt top. 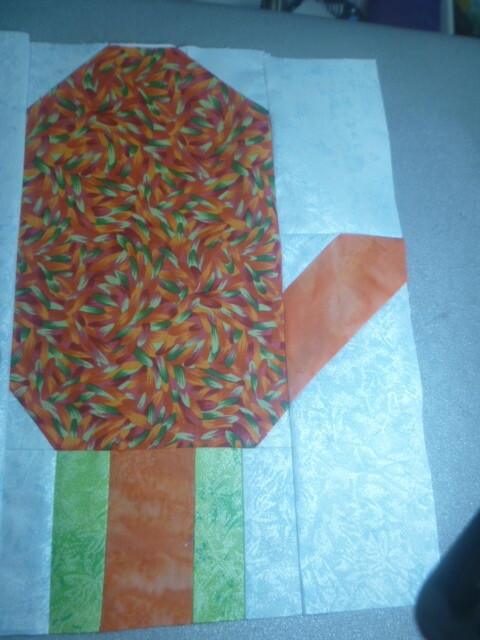 After the rows are all together, the border is fairly easy to measure and attach. As you can see, the 88 blocks now have one side sashing with cornerstone and the bottom sashing on them. After I arrange them, they should go together quite rapidly. Fortunately, the sun was shining and there were no emergencies or strange interferences this weekend. There’s nothing new to add today as I have been off the foot for 2 days. I’m hoping it will feel like having a shoe tomorrow. 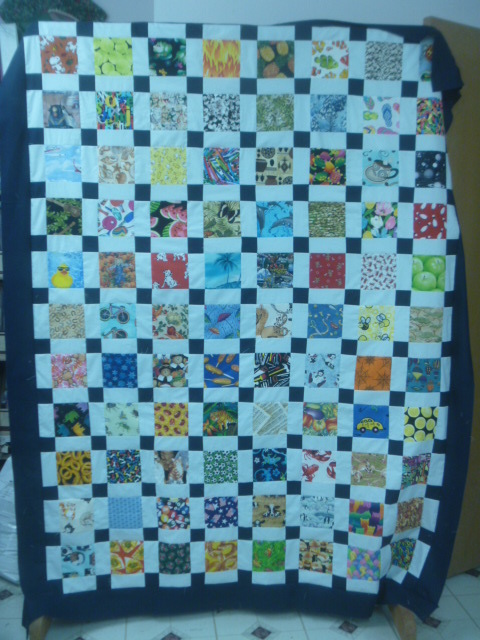 Little by little is the way I often get quilts done. 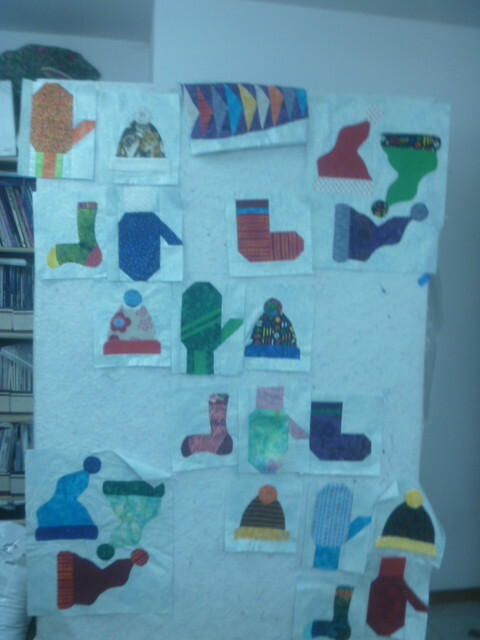 I spent a couple hours and did get the bottom on all of these quilt pieces. Oh, and no photo here, I did have to have two curling nails removed on one foot, so was told to stay mostly off that foot for the weekend and soak often. The Dr. says they will grown back in 5-6 months, but it’s only the first 3 days that I need to be extra careful. So I came home, had lunch and took a nap. I’ll be good and lazy so I can soon get back to normal. It seems that the garden has an endless life. That’s not all bad, since we continue to eat. It would help if the weeds weren’t so dominant. 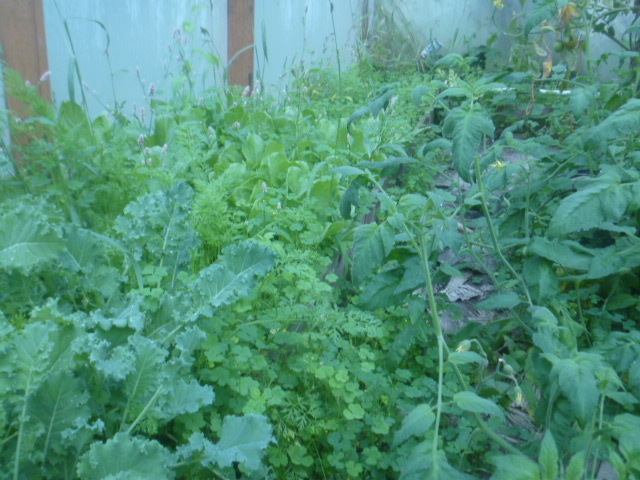 Here is one section of kale, lettuce and plenty of weeds. I spent a couple hours pulling weeds. 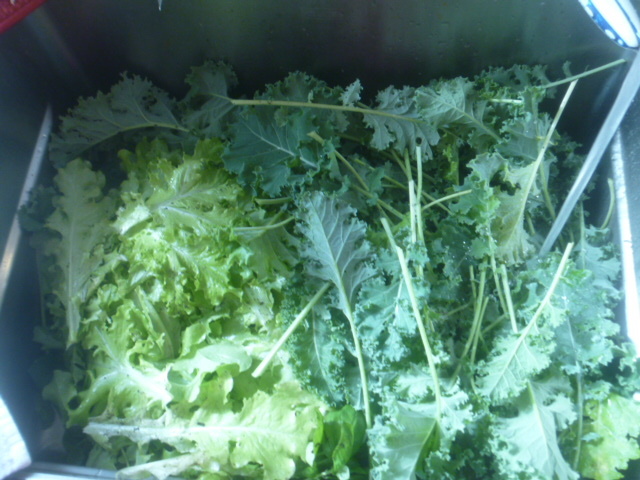 then, picked enough for a sinkful, which of course then had to washed and put in refrigerator and some of the kale went into the freezer. Then it was celery time. You probably don’t remember, but I purchased two – 2 six packs of started celery as I didn’t need a lot this year. Well, in each of those little holes, they scattered several seeds. I planted more like 70 plants because I hate waste, so I just planted all of them. Today was a day of reckoning and I pulled and washed and cut and put in the freezer about 20 stalks. But since this is less that half of what is out there, I was very generous with the chickens and they got all the leaves that I usually dehydrate and then use for seasoning. There really are limits. And the celery will winter over. When weeding, I found these three little midget personal size watermelon. I mean these were even smaller than the cantaloupe. I did not expect them to grow and for sure they did not get the water they needed. Next year I will do better. 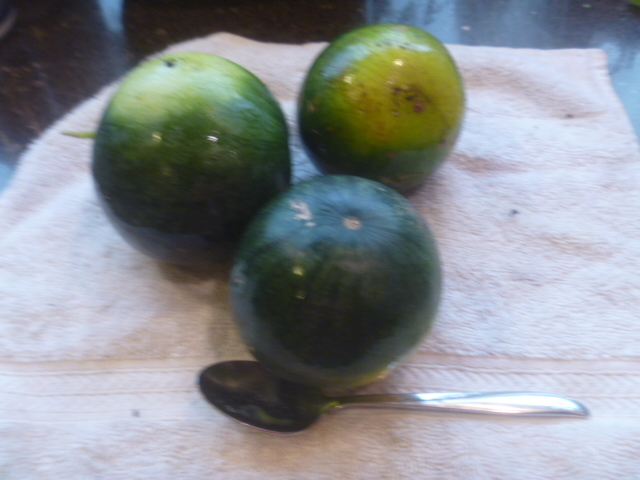 I put a teaspoon by them so you could see how small – about like grapefruits. But they tasted like the real full sized ones. And then the tomatoes. I have another 3/4 of a 2 gallon bucket to deal with from the greenhouse and it rained so hard this week, I’ll assume all the outside tomatoes are done. Oh, I can’t forget the raspberries. I picked about a quart. There will be one more small picking. I am tired of the garden for this year, but it doesn’t have much time left and winter will be here and I will be so happy for a full freezer and what has been dehydrated. God is so good to have provided the food our bodies need. We moved them from the freezer to bags this afternoon and put the bags in the freezer. 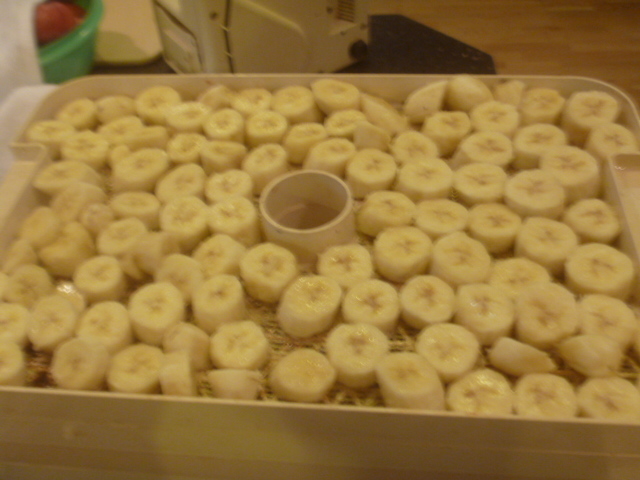 The dehydrating ones aren’t done, but will make delicious sweet pieces this winter. 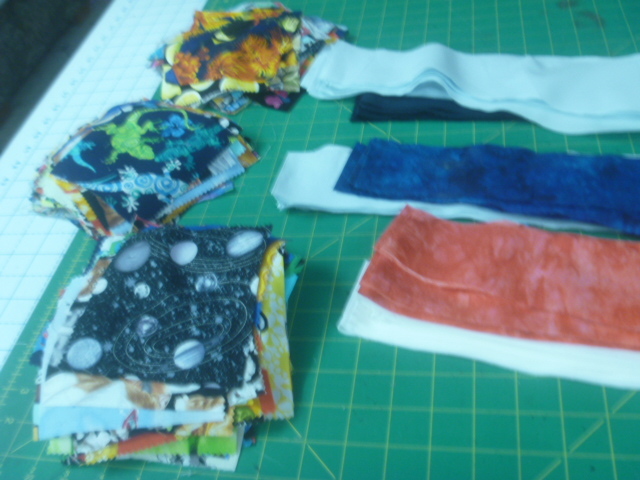 Then it was off to the sewing room where I chose and cut fabrics for 3 twin size “I spy” quilts. 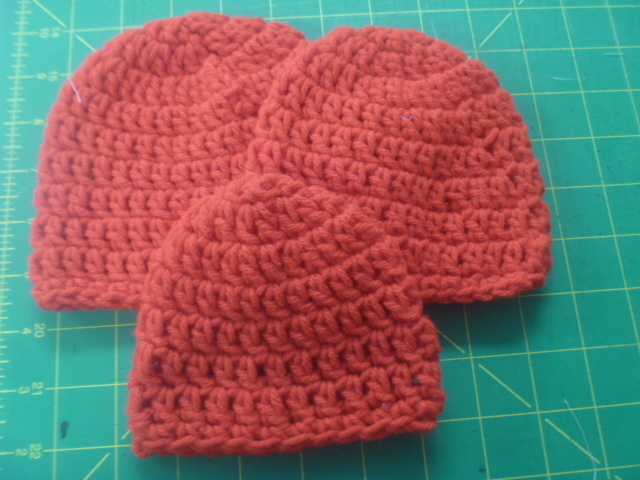 Today I opened my mail box to find this request for little red hats. It just happens that there has been a skein of red yarn floating around here for the last week. I have no idea from where it came or why there might be only one. However, I did put it to good use. 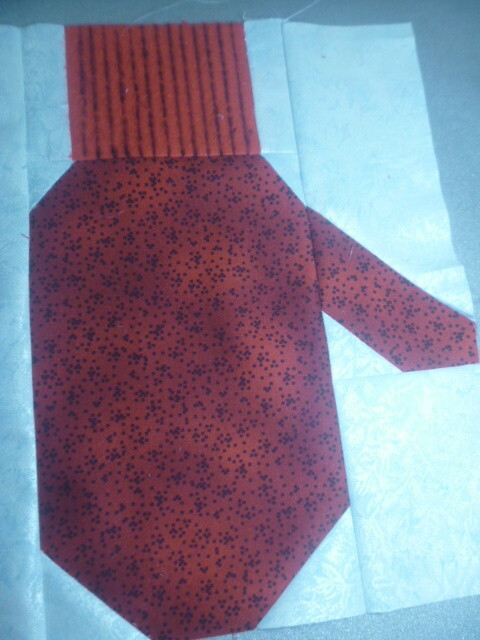 I did one in newborn size, and 2 sizes for preemies. 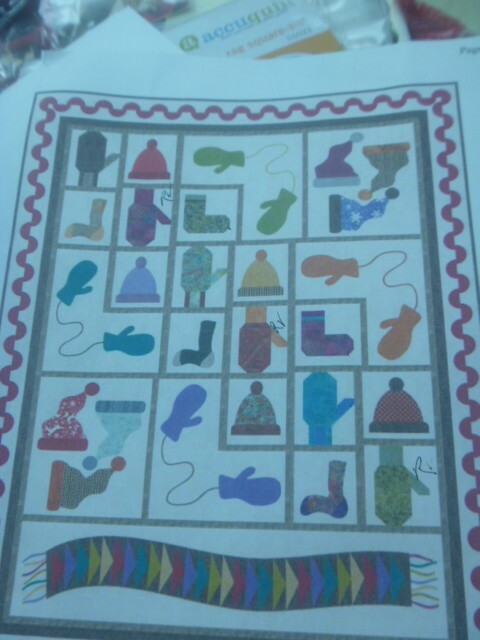 Denise Russert has a block of month going called “A Knitter’s Gifts” on which I have been working. 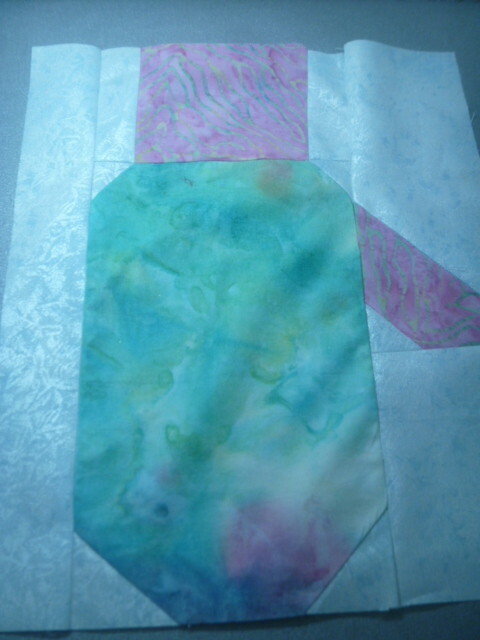 This month was paper piecing which I find very challenging. Here is her drawing of the finish. It seems during the summer that the week starts in the garden – most likely because we didn’t check on it the previous day. We went to the garden with the intention of picking tomatoes, however, 17 of these personal sized cantaloupes filled the 5 gallon bucket. They are incredible sweet and juicy. So a second trip to the garden brought in some of the tomatoes. 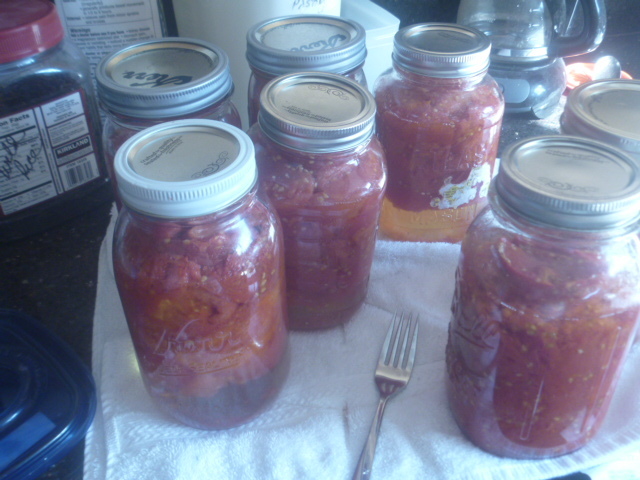 I canned 7 quarts. Now here is the problem: with all the jars of beans, salsa, jam etc which was well over 150 jars, I only had 2 that didn’t seal. With these tomatoes, out of 7, 3 did not seal (yet) and I don’t know why. They will get a chance to go back into the canner tomorrow. Did you know Safeway delivers? After a two unsuccessful attempts to use my personal special price they emailed to me, in the store, I called their delivery customer service rep. She was very patient and we got it all set up and the first delivery is free. After that there is a small charge – she thought about $6. The driver arrived with the bananas just as the tomatoes started boiling and brought them into the house where l ‘ll be working on them – probably Wednesday as they are green. 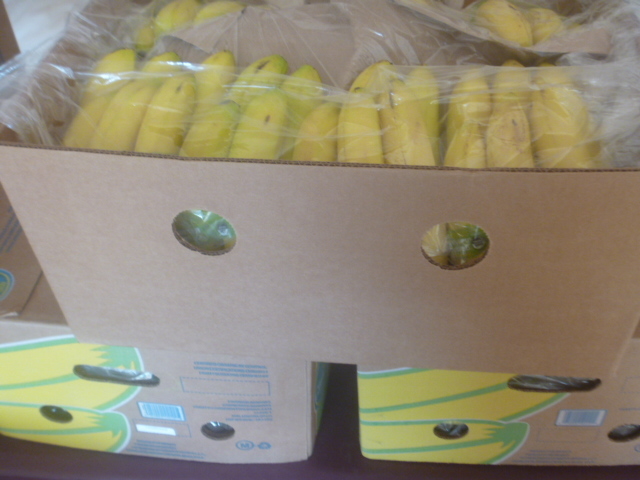 The reason I wanted this many bananas was because we use at least 2 daily. 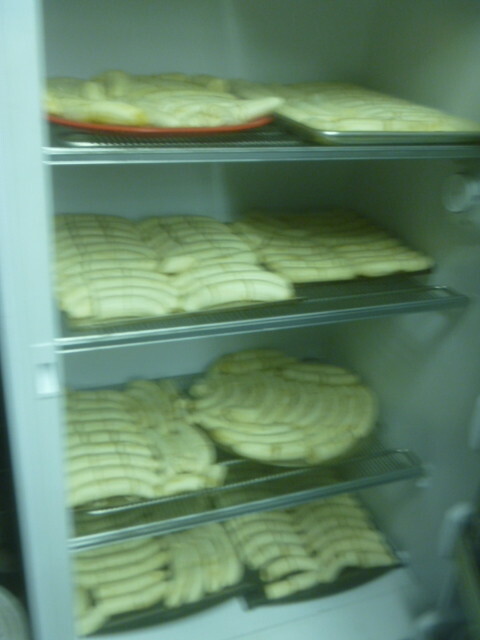 I wanted to be able to freeze some and dehydrate some for snacks. It was also good I checked the bill as they had charged me $1.09/# instead of the .69, I was supposed to be charge. When I called it to their attention, the fellow was really sweet about it and refunded the difference, saying he didn’t understand how it happened in the first place. I met two lovely people on the phone and have the organic bananas that I want at the good price. All worked out in the end. 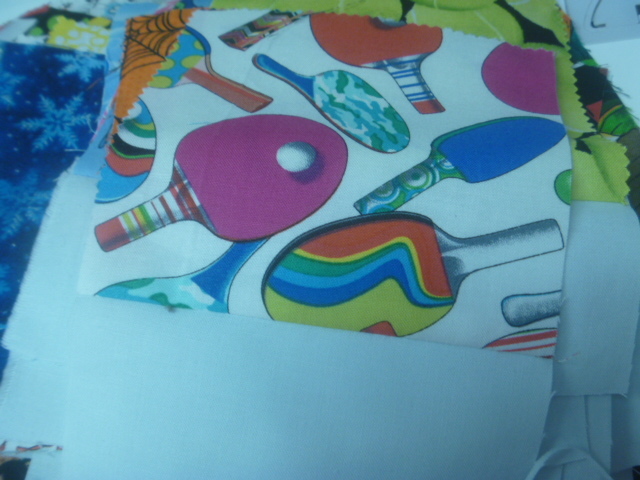 I was tired by now, but this blog is supposed to keep my fiber adventures motivated so, I put together this September block from the Pat Sloan Trip around the World BOM. 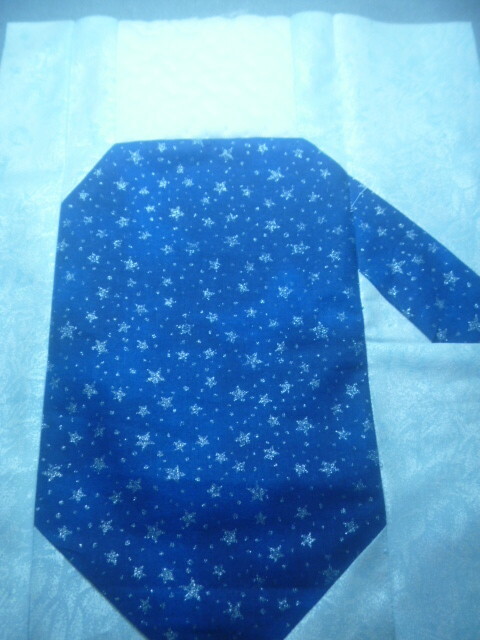 This is the placement photo. 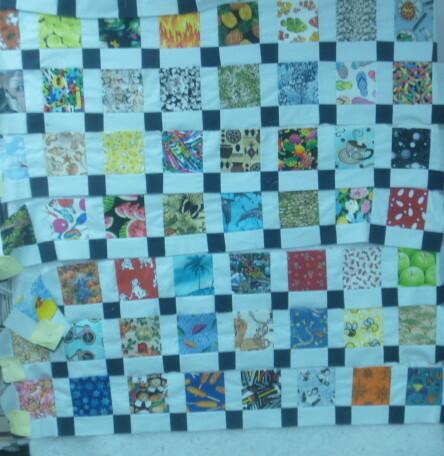 We are now done with the large X interior block and all the small ones around it. So we will probably beginning the sashing between the blocks next month.